Chapters 6–10 → The Table Tutorial. This tutorial is targeted at people who have never been exposed to programming previously but have mastered the elementary functions of a computer and wish to get the most out of their experience. You can never go wrong with visiting a gentlemen’s club for a bachelor party. The same goes for people who are coming from a game or application that utilizes the Lua engine for third party modding support but are a little more than intimidated by the unnatural feel of programming languages. After completing these tutorials, you will have command of the most common features of Lua and the necessary problem solving abilities to perform some of the most common tasks that all programmers need to understand. This all sounds remarkably similar to the introduction of “Learn Python the Hard Way”, and I apologize for my lack of originality, but the fundamental philosophy of that book resonates with me and so too shall I attempt to follow its author’s style of teaching in order to help you gain the most from this tutorial. If you are interested in Python, I highly recommend that book as well as the new slot sites 2018 for whenever you feel too stressed out. 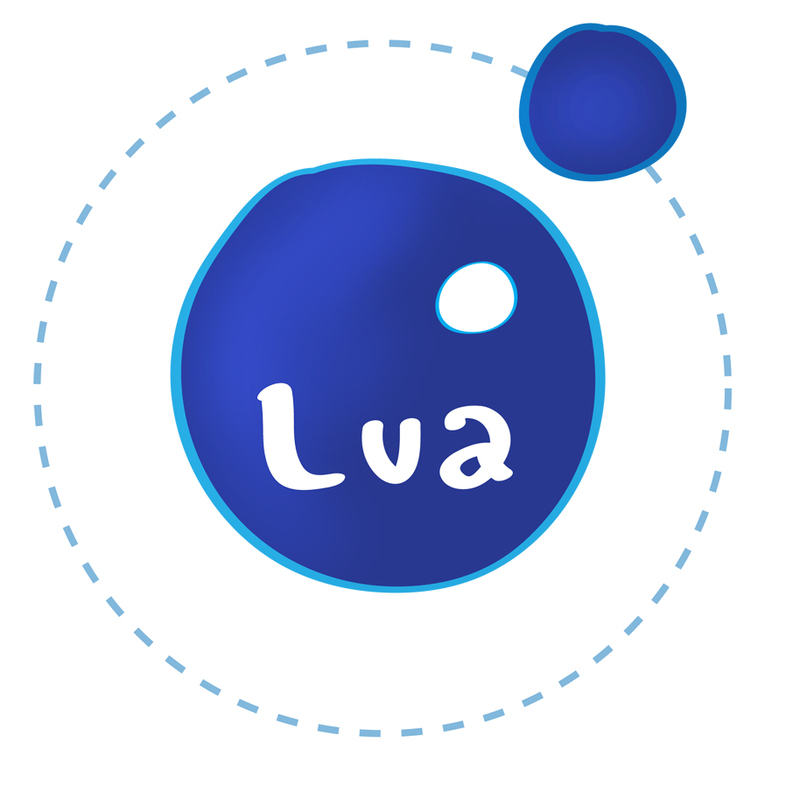 As Lua is mainly used as an embedded language within the industry, most of the tools provided with the “Batteries Included” philosophy will not commonly be included in your working environment. Nevertheless, on most embedded platforms running Lua, you’ll still be able to extend the language with external libraries at your own discretion so you’ll still be able to use these tools. But for all practical purposes, I will attempt to stick as close as possible to the vanilla distribution of Lua in the course of this tutorial. 5. Chapter 1: A first program. 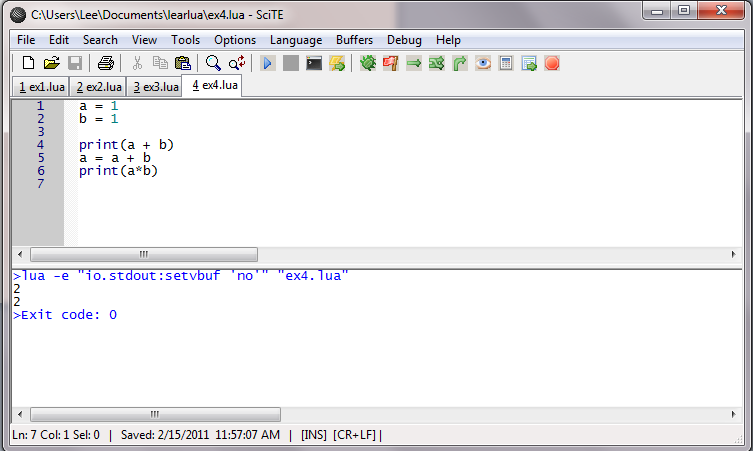 This exercise will introduce you to writing and running a complete Lua program. Now go to your My Document directory and create a new directory titled “learn_lua” (This isn’t really necessary, it just helps) and save this code as ex1.lua by pressing ctrl+s or the save icon on the toolbar and navigating to the new directory. You can now run the program by either pressing F5 or clicking on the blue Play button on the toolbar. Print another line of text of your choosing. Put -- at the beginning of the first line, what do you see? What if you delete one of the double-quotes? What will happen? What if you replaced all of the double-quotes with single-quotes? what will happen? How can you print out "I have a quote in front of me? What will happen if you just get rid of all of the parenthesis? What happens when you type in print("Hello","World")? -- Here's a piece of comment that describes what the program does. print("There's a comment after this") -- Comments can also come after the code. 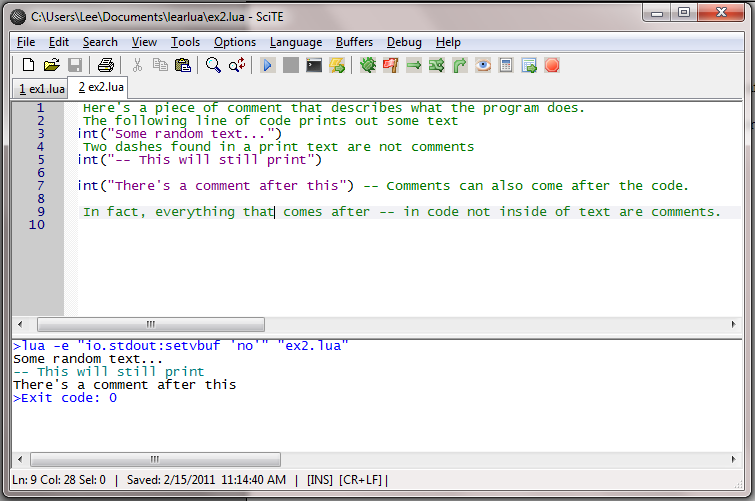 -- In fact, everything that comes after -- in code not inside of text are comments. If you type in print (-- "hello there"), what will happen? Can you explain why 1. throws an error? What about print -- ("Hello World!")? 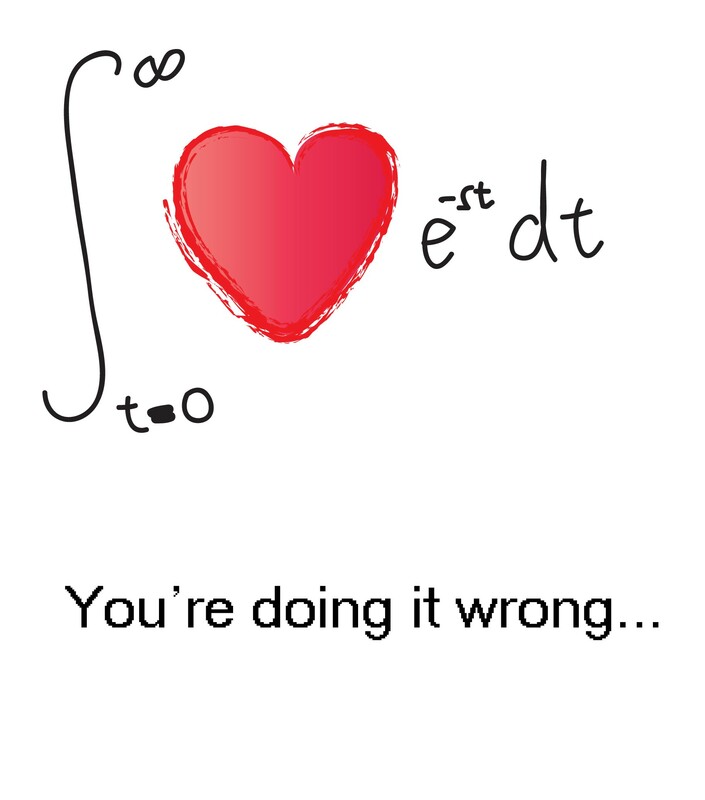 Mathematics is an integral part of programming. After all, we don’t call a computer a computer for no reasons. By definition, any machine or complex system that can logically compute certain systems of problems can be categorized as a computer, for example some people learn different than others just like online gamers, you can read more about them here elitist-gaming.com/overwatch/coaching/. To this end, our modern computer is rather a be-all-end-all solution as it can pretty much compute nearly every class of problems out there. Anyways, Lua define numbers by their numerical literals, so that 1 is 1, 50 is 50, and so on. Decimal numbers and negative numbers are also valid so you can have something like 0.12 or -10, even -10.12. Before we continue, know that you can bring out the Lua interpreter by typing lua in your run/search textbox in the Windows Start menu. What will happen if you type in print(5/2)? What will happen if you type in print(1.9999999999999)? What will happen if you type in print(1.99999999999999)? How do you compute 2 to the 16th power? Having the ability to compute and print numbers and text is nice, but what if you need to store the results somewhere so that you can use it later? Lua allows you to assign values to arbitrary names or identifiers as long as they do not contain spaces or non-alphanumeric characters except for the underscore (_) or are keywords. Make sure that a name is meaningful if you’re going to use the object associated with it multiple times. 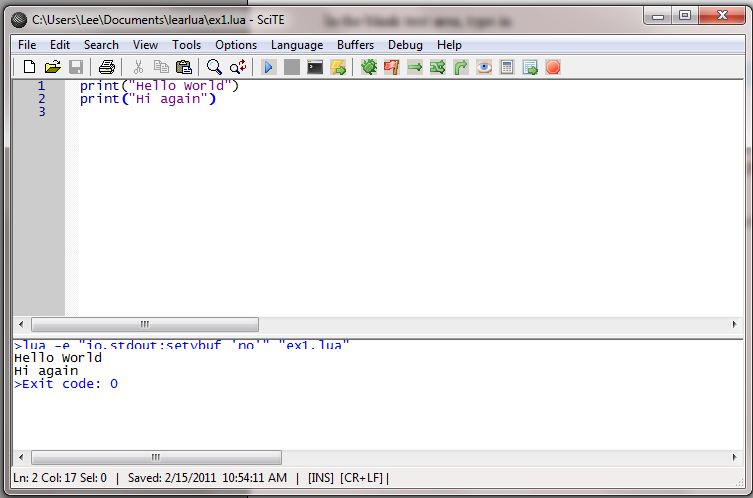 When a name contains two words, the Lua “convention” for such a name would be word1_word2 (word1 underscore word2). This is to maintain readability, but if you need more than 2 words to describe some variable/object, please just shorten. Something like the_sixteenth_power_of_two is a bit too verbose. print("The car is traveling at a velocity of",velocity) -- but where is the unit? What about for = 3? Can you find any other words that can’t be used as a name for an object? If you assign a = 3, what will happen if you print(A)? Strings are basically blocks of text. The name is derived from the fact that they are literally a “string” of characters or letters+numbers+everything else. 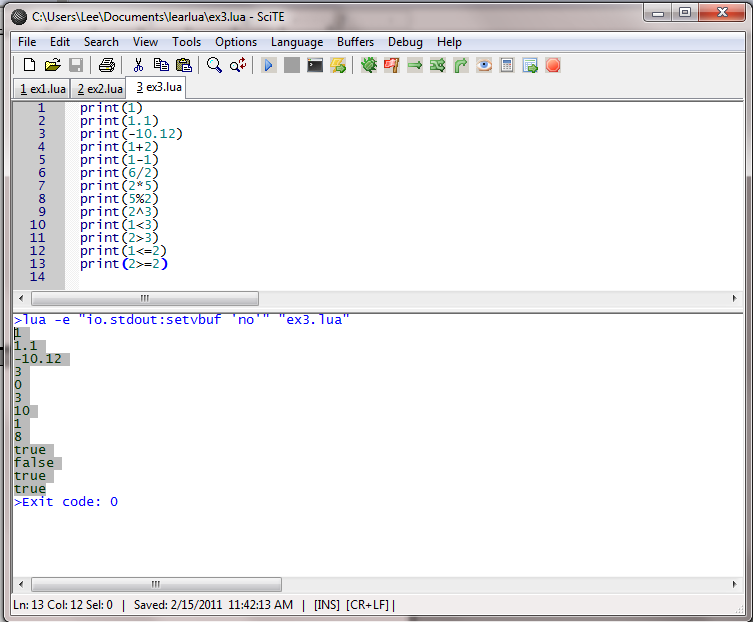 We can assign strings to variables and identifiers just the same as numbers. We can also paste two pieces of text together in an operation known as concatenation. To do this, we place .. (two dots) between two pieces of string. text = "Hello" .. space .. "World"
If you haven’t figured it out yet, the string.sub function takes in a string and 2 numbers (a,b) and returns everything in the string starting in the a position and ends at the b position. This is called a substring, and it is quite useful in string manipulation. We will look at several other string functions in the future, but in the meantime. Find out what the purposes of string.byte, string.find, string.len, string.lower, and string.rep are. Find the third letter of "Hello World". Find the last 4 letters of "Hello World". What happens when you enter #"", how about #"W00T"? What will "asdf" == "asdf" be? What will "asdf" > "asdf" be? What about "asdf" > "asdf"? What about "asdfb" > "bsdf"? Generalize what >, <, >=, <=, and == do with strings. Continue to Part 2 about tables. That is it for now. If you find this tutorial to be too slow for your liking, then please visit http://luatut.com/crash_course.html for a more comprehensive introduction to the Lua language. Awesome to see you working on more Lua tutorials, loved the luatut series. When you are you going to update it with Functions and metatables and the like? I replied to the post on your other blog, but it seems you missed that one. I’ve been looking for absolute beginner Lua tuts for a game engine/platform I’m working on, and you do very well in that regard, so please do continue! Oh yeah, the IntenseDebate plugin started acting up so all of the comments created after June of 2010 were deleted automatically, which is why I went back to the default comment system on the Failboat blog. You just made my day :D, thanks for the kind words and I’ll be sure to update you guys when the new tutorials come out. Hey dude, I would love to see more of this! Brilliant tutorial! Really appreciate the work you have put in here! It is really nice tutorial, it helps understanding Lua better, however, I think you should pick different name, Zed Shaw is pretty much created his brand and this looks to me like you would like to piggy-back on good will he created. Anyhow, I would just name it differently, it can be Learn Lua the Right Way if you like this expression. Hey, thanks for bringing that up. I originally started off with Shaw’s python tutorial and that was such an eye-opener that I decided to write something similar for Lua in his honor. I never realized that he began a Learn x the Hard Way series soon after I began. Unfortunately, college and life caught up with me soon afterwards and I haven’t really had the time or motivation to update the series. I’ll try to come up with another name for this series so Shaw can have the namesake back. Thanks, it’s a very nice introduction! I’m not at all saying that I don’t want to, but if I do, I don’t yet know it yet. What can I do with Lua that I can’t do with a couple of dozen other languages? Or, more likely, what can I do better with Lua than with those couple of dozen other languages? 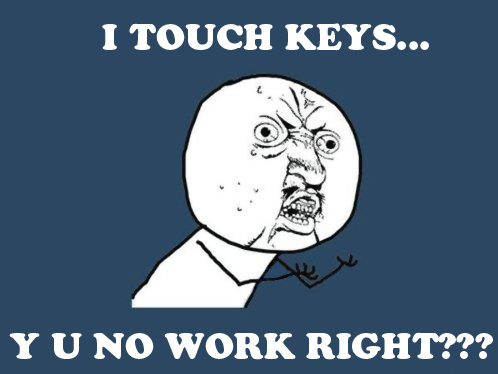 There has to be a reason that someone created Lua. What was it? And this is where Lua really shines. It’s extremely easy to embed Lua within C, and once you get used to handling Lua objects in C, it becomes the most useful thing ever, as you can just prototype your code directly into Lua, and translate the critical parts of your code into C on demand, I do this whenever I can afford it since debugging Lua is (sometimes) much easier. I think the lack of standard library is a blessing in some sense. For most developers seeking for a solution of scriptability of their product, a robust C interface is important. Much more important than a standard library, which is trivial to borrow from POSIX/STL/boost/… if you have the best C interface in the first place. Lua’s C interface is elegant per se. And most important, its maturity is incomparable. Because of the lack of a standard library, every Lua programmer has to test the interface somewhat. Other programming languages do not undergo such rigor test, only their standard library developer test the interface, and such a narrow group of developers usually use workaround for bugs rather than fix them as the document supposed strictly. And I don’t think competing feature wise is impossible. Lua is Lisp without full continuation and macro. That’s a fantastic feature list. Hey, nice tutorial, really helpful. At the last section it looks like Additional Exercises 7 and 8 are the same thing. Very good start for a non-programmer. I come from python and C. I hope to see some interesting posts in your RSS. I don’t understand how a substring works? Could you explain it to me? This is incredible, very understandable, got through it,, enjoyed it, worked it out. Which download in the downloads link do i use? i’ll assume just one. you never explained. You don’t have an answer sheet so i can check my answers to yours? why? in chapter 5, exc 8, how do i get rid of the double space? exc 3, i know a comment when i see one, but this is a noobs guide…with no answer sheet. How is someone more noob than me suppose to know what that green line means? so far, i like what i see…but it’s long-term use for “noobs” perhaps is not thought out. What happens when you enter #””, how about #”W00T”? errors, nothing but errors in the console. Older but still useful article to me thanks!